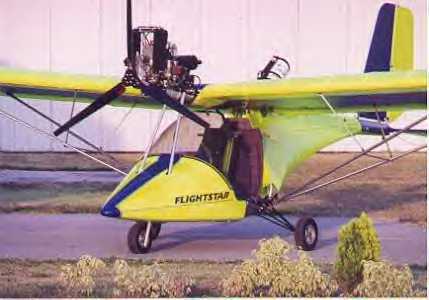 The Flightstar 11 which was introduced in 1992, traces its roots back to the early days of ultralight aviation. It was one of the first mass produced craft offered by a financially secure company. The design utilizes aluminium tube bolt together construction covered in Dacron sail cloth. Seating is side by side in a 42 inch wide cabin. Building times are in the 150 to 200 hour range. The latest production models have folding wings for easy storage. The craft can be purchased in two configurations completely enclosed or with a fibreglass nose cone and windshield.